User instruction:https://drive.google.com/open?id=0B-9qwhphAfwNcnhzNFBKRm52ZTgThe Oil Diffuser Air Purify with Aromatherapy care not only can purify the inside air of the car. but also can release your driving tiredness to stimulate metabolism.How to use : It is used only when the car engine NOT use greasy aroma oils is started.keep the sponge core reach the top in place inside a spring don't rip off and Cotton swab completely wet.1.Slightly touch the button, when Blue light is on , it means enter humidification mode. 2.Touch the button again .indicate the blue and red light on together. it means enter Aromatherapy mode. It is needed that drip A few drops of Aromatherapy water before you use. 3.press the button 3rd , left red light is on , it means shut down mode.Happiness is always on the road.Add water is recommended.Only need 1-2 drips Aromatherapy oil encough to create smell mist from sponge wick clog.Aromatic brings joy, relaxation and a good sense of smell for you. We look forward to sharing with you a happy and healthy life. In your car, you feel so eased, comfortable and relaxed. General Fault Settlement: 1. Light does not shine: If the power indicator does not shine. Answer:It may due to the car head fuse blown, tools can be used to remove the car head nut, check the fuse is blown, can be replaced by 250V / 500ma fuse to solve. 2. No fog: blue light displayed while Atomization piece surface is also very clean, but not spray. Answer:In this case need to check the suction wick is installed in place, can be re-installed through the correct suction wick assemble. 3. Touch without respond,Fingers are clean, no water, nor dry, but no matter how touch, Keep the same light color . Answer: You need to disconnected electric for 1 min ,waiting for IC component sensor reset. Creative air aromatherapy humidifier car charger.the package contains 2 sponge wicks.Note: If you have quality problem ,pls direct contact seller firstly. Humidification function: humidifies the air in the car and refresh the quality of air we breath. 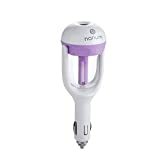 Purification function:get rid of static, reduce the radiation and sterilize. - 180 degree rotation, to adjust the direction of the vapor and make full humidification. Aromatherapy function: pleasant smell helps you lift your mood, relieve tension and anxiety, and boost the metabolism. 2 hours power protection: After continuously working for 2 hours, it will cut off the power automatically. Material: ABS, PP and electronic components, anti-corrosion.